A natural shampoo for regular hair care for all animal species which tolerate bathing. The natural substances have been selected to ensure that the shampoo is non-irritant, completely non-toxic, pH-neutral, and with a calming effect even on sensitive skin. Its scent is pleasant for people as well as animals. Although it does not irritate the eye in cases of inadvertent contact, it is necessary to rinse the eye as the shampoo has degreasing effects. The product has anti-inflammatory and repellent effects, i.e. it repels external parasites for as long as 14 days. The repellent effect is borne by cider vinegar and particularly a mixture of rosemary, thyme and other essential oils which bind to residual skin and hair fat. The product contains Podhájska hot thermal spring water. - For regular hair care. In creates a velvety shiny hair and makes hair stronger [Gynevet]. - For sensitive and irritated skin [Kingvet]. - For skin inflammations [Kingvet, Renovet, Audivet]. - For extreme burden caused by blood-sucking insects (particularly mosquito invasions) [Gynevet]. - A repellent product against invasions of ticks, common and biting lice, and mange mites [Gynevet]. Aqua, Decyl Glucoside, Acetic Acid, Cocamidopropyl Betaine, Disodium Cocoamphodiacetate, Extractum Herbarum (Pulmonaria Officinalis Extract, Rosa Centifolia Flower Extract, Cinchona Calisaya Bark Extract, Sophora Japonica Fruit Extract, Verbascum Thapsus Extract, Zingiber Officinale Root Extract, Cetraria Islandica Extract, Tussilago Farfara Flower Extract, Galeopsis Segetum Extract, Glycyrrhiza Glabra Root Extract, Hyssopus Officinalis Herb Extract, Thymus Vulgaris Extract, Aralia Cordata Extract, Curcuma Longa Root Extract, Equisetum Arvense Extract, Origanum Vulgare Extract, Plantago Lanceolata Leaf Extract, Tropaeolum Majus Seed Extract, Althaea Rosea Flower Extract), Parfum, Xylitol, Xanthan Gum, Cellulose Gum, Hydroxyethyl Urea, Geraniol, d-Limonene, Linalool, Citronellol, Rosmarini extract (cinéole, camphre, pinéne, limonéne). - Apply a small amount of the shampoo to wet hair and rub in thoroughly. - Leave for approx. two minutes and then thoroughly rinse with water. - If the shampoo does not form enough foam, the hair is too greasy. In such a case the whole procedure should be repeated. It is necessary to rinse the shampoo out of the hair thoroughly. It is recommended to use the product within three months of opening. Keep out of reach of children! Immediately after washing the hair is too strong and exhibition condition is achieved only on the following day. The product does not destroy external parasites, only prevents their invasion for as long as 14 days. Although the shampoo does not have immediate irritating effects, it should be well washed out of the eye upon contact. Store the product in dry and dark environment, at 10-25°C. Do not freeze. Minimum shelf-life specified on the packaging. 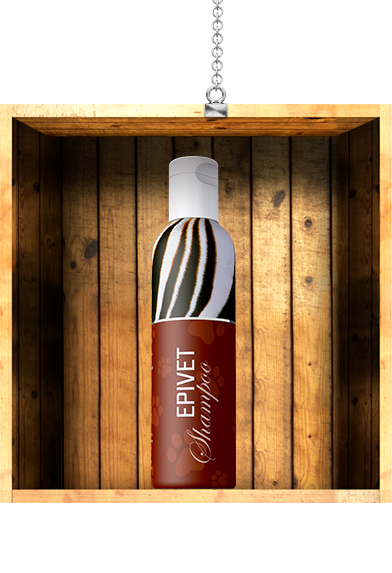 Epivet is my long-time favourite from the Energy line of products. It can be safely used in dogs with hypersensitive skin or skin prone to inflammations. Its huge advantage is its repellent effect.